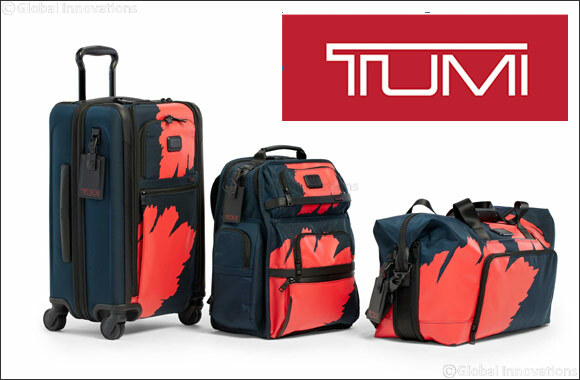 Dubai, United Arab Emirates - April 14, 2019: Building on its foundation of innovation, functionality and durable design, today TUMI launches the next generation of intelligent travel: Alpha 3. In 1983, Tumi introduced its signature Ballistic Nylon, a material that revolutionized the travel market. Originally used by the military to protect WWII troops from shrapnel, TUMI incorporated the ultra-tough material into its luggage designs to make bags that would withstand the wear and tear of a life well-traveled. After rigorous testing proved it held up, TUMI added its patented functionality: U-zip pockets, telescoping handles, dual wheel systems, Add-a-Bag, expansion systems, TUMI Tracer®—interior and exterior features designed to make life on the move easier. The combination created the most reliable, time-tested travel companion the industry had seen. Now, 35 years later, TUMI remasters its iconic collection with Alpha 3. The new Alpha 3 collection is a celebration of everything TUMI stands for: design innovation, engineering, functionality and performance. The relaunch moves the brand forward by elevating the collection that represents its foundation, adapting it to the changing world and incorporating learnings from the past decade. With the new A3 collection, TUMI offers freedom—from frustration, inconvenience, and irritation—for those who seek to be present on their journeys. With a cleaner, more refined aesthetic, Alpha 3 updates include an integrated USB Power Port added to each of the carry-on sizes, dual-access entry, modernized front face with protective rails, full access front pocket for increased functionality, dual-coil security zippers, and a sleek leather rain flap on bags. The newest luggage style is the Tall 4 Wheel Duffel Packing Case which offers top- and split-case access and features four interior shoe panels. New bags include the Slim Backpack, a compact backpack designed for those with a lighter load, the Slim 3-Way Brief, a sleek business offering that can be carried as a backpack or a bag, and the Expandable Tote, a highly functional easy-to-carry men's tote. The collection will be available in Black Ballistic, Black Leather, and Anthracite with brown leather trim. Seasonal pattern Graphic Congo will also be available, adding a pop of personality to select styles. “With the launch of A3, we took everything we stand for as a brand one step forward. The world of travel has changed. Technology has changed. The way we navigate just to get through security has changed. Therefore, we must change too,” says Victor Sanz, TUMI's Creative Director. “I wanted to reimagine the designs that have inspired a generation of travelers; to improve upon the timeless styles and incorporate the newest and best technology, offering our customers best-in-class products that will stand the test of time and inspire the next generation of travelers. Previous Story : Three designer brands to launch exclusively at DIVAlicious 2019!